I'll be reporting soon on some observations from the Jaipur Literature Festival held this past week in Rajasthan, India. 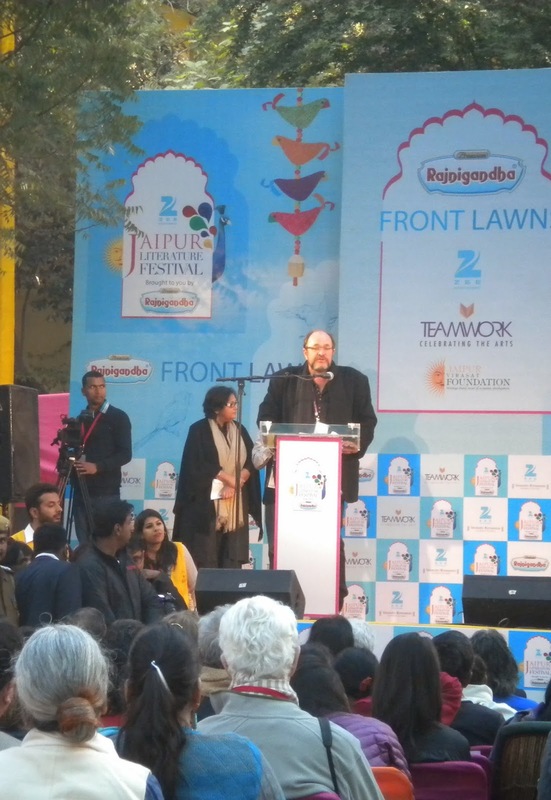 The festival was created by author William Dalrymple (seen here during the opening session) several years ago. He jokes that 14 people attended the first year, many of whom were a group of Japanese tourists who had lost their way and walked into the venue in error! Now, thousands attend and hear presentations from and mingle with many of the leading authors from Asia and around the world. The event is a non-stop five day affair, with parallel sessions from 10am to 6pm every day. The major problem you face as an attendee is choosing among them. But for a humorous introduction to the local culture, though, here's a scene from nearby Jodhpur. The old city is a rabbit warren of narrow curving streets, occupied by a cacophony of horn-beeping rickshaws and motorbikes. Every now and then gridlock ensues. Here's a short video to give you a taste. Note, in particular, the arrival of a pedestrian who offers "helpful" advice to one of the rickshaw drivers. And then, note, too, the humorous acceptance of the situation by a bevy of motorbikers. If I had to apply two words to life in India, one would be "acceptance," as seen here. The other would be "scrapping," as millions of people claw their way to survival and, with luck, success.